Sean started in hospitality at the young age of 13; and during his high school career won several awards from Johnson & Wales University in the full service restaurant category through DECA. At the age of 15, Sean started working for Mazzone Hospitality and has since worked almost every position. A 2002 alumnus of Johnson & Wales University, Sean graduated with a two-year degree in Culinary Arts and a four-year degree in Food Service Management; and in 2004 graduated from the Schenectady Leadership Program. Sean has overseen both venue operations, Off premise operations, Kitchens, as well as oversaw the merger of an acquisition of a competing off premise catering. 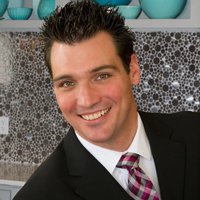 Sean serves currently as the Vice President of Catering Operations for Mazzone Hospitality. Sean’s unique ability to create and train operational teams and solve the hardest of logistical problems has been a huge asset to Mazzone Hospitality. Working his way up in the company has given him the prospective to manage and train each level in the hospitality industry.